The Hare and the Tortoise…more commonly known in the U.S. as The Tortoise and the Hare…. 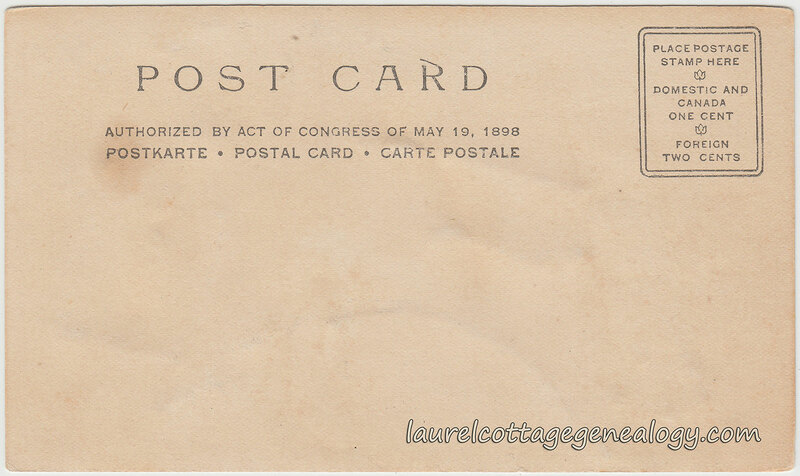 The back of the postcard indicates “Authorized By Act of Congress of May 19, 1898″ so this is a Private Mailing Card or PMC. The short PMC era ran from May 19, 1898 to December 24, 1901 when the new postal regulations ushered in the Undivided Back era. The size is smaller than what we consider the standard for postcards and measures about 5″ x 3”. This beautifully done postcard is in very good shape for it’s approximate 115 year age, and includes glued on glitter highlights. In particular, the expression on the poor bun’s face is priceless, that panicked “Oh, no!” feeling, and note the beautiful, and correctly done, long bunny eyelashes! Private Mailing Card. Circa 1898 – 1901. Unused. Publisher unknown, number 32. Sources: The Tortoise and the Hare. n.d. http://en.wikipedia.org/wiki/The_Tortoise_and_the_Hare. (accessed February 26, 2015). Gustave Doré. n.d. http://en.wikipedia.org/wiki/Gustave_Dor%C3%A9. (accessed February 26, 2015). “Solution Pautauberge.” Creighton University. Web accessed February 28, 2015. 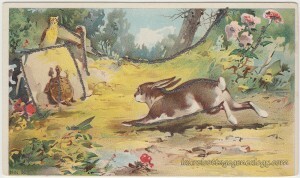 This entry was posted in Animals, Owls, Postcards, Postcards Unused, Private Mailing Cards, Rabbits - Bunnies, Tortoises - Turtles and tagged antique postcards and private mailing cards of forest scenes and animals, bunny eyelashes, fables of Jean de LaFontaine, French artist Gustav Doré, owls as judges, Private Mailing Cards and Postcards of the Tortoise and the Hare by Annieoakley. Bookmark the permalink.